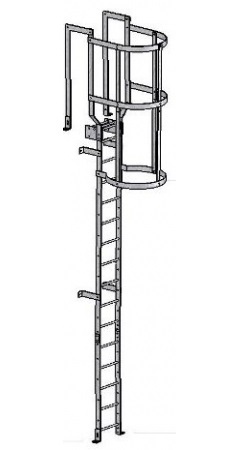 We supply Caged Ladders also known as Hooped or Cat Ladders. Most ladders are off-the-shelf and delivered to you flat packed for you to assemble on site. Our Standard Modular Ladder Systems are constructed of Mild Steel, Grade S275, generally to BS4211, of bolted construction and with Hot Dipped Galvanize Finish in accordance with BS EN ISO 1461. We now also supply Stainless Steel, Grade 316L, to order. Our Fixed Access Ladders provide safe, easy and economical access for applications in many different environments. Industries such as, Oil Rigs, Petrochemical Plants, Sewage Works, Ships, Harbour Walls, Airports, Aeroplane Hangars, Manhole access and provide an ideal solution for maintenance access in most buildings. Consistency of our product comes as standard, as does our level of service. We work very hard to maintain this, we are totally committed to you the client.